Not A Fancy Restaurant? We Have You Covered, Too. Our services go well beyond the kitchen. We serve the needs of industrial and manufacturing facilities as well. Here at Facilitec West, we understand the need for proper airflow and fire safety, no matter what industry you’re in. They create exhaust effluent laden with oil, grease and other chemicals. As these build up in the exhaust system, they inhibit proper air flow, becoming both a fire and health hazard. 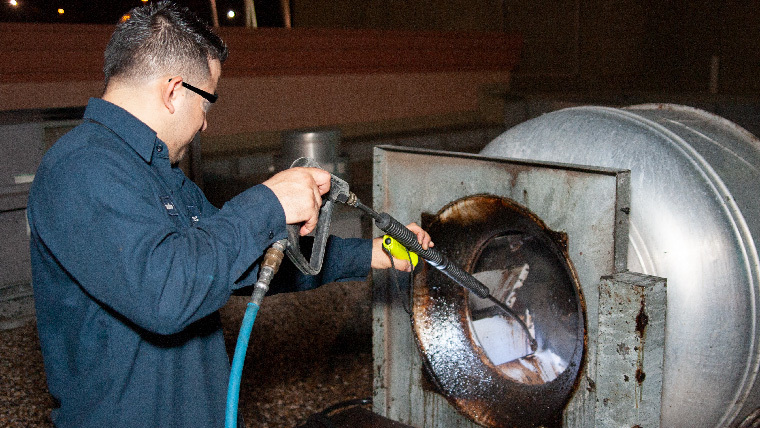 Decreasing the build-up of hazardous fumes within your facility. Helping to prevent deadly, costly fires. Facilitec is available for last minute servicing as well as regularly scheduled maintenance. We can come to you both during and after hours, as well as provide 24-hour emergency services. Our complete services can be customized to fit your needs. Our technicians are trained in the latest techniques and consistently meet even the highest expectations of our customers. If you’re not 100% satisfied, we aren’t doing our job. Experience the difference with Facilitec West, a team you can rely on. Call us today at 888.463.2293.